A face-to-face meeting reveals there’s a serious side to the actor portraying the bad-boy Dean Winchester in Supernatural. It is quite early in the morning when actor Jensen Ackles arrives at the interview room in a hotel at The Rocks in Sydney, Australia. A fact that he seems to be acknowledging silently – the handsome actor looks as if he has just stifled a yawn (in order not to be rude, you know, he being Texan and all) and his eyes have enough evidence that he’s tired. Maybe the early hours is a reflection of Ackles – who plays the mischievous, energetic and amusing Dean Winchester in the TV series Supernatural – as being very serious right now. Or maybe that is just who Ackles is. The most obvious thing he shares with his character at the moment is his dressing – like Dean he’s wearing a long-sleeve shirt that’s folded at the cuffs, a T-shirt underneath, with jeans and boots. He does not feel the need to fill the silence by chatting incessantly or cracking jokes, projecting himself as an attentive and professional young man instead. “We look alike, which is great,” begins the 30-year-old actor to the question if he’s anything like Dean. Making thought-out decisions was what ensured that Ackles completed his high school education at Lloyd V. Berkner High School in Richardson, Texas, first before becoming an actor, even though there were two agents keen to sign him up after seeing him in an acting seminar back in Dallas. They pursued him for two years. And although he had already registered to go to Texas Tech University, they got Ackles his first audition, a guest spot in the series, Sweet Valley High. The rest wasn’t immediately history as Ackles continued to take cautious steps. But having grown up in a family where he constantly saw his actor father, Alan Ackles, studying scripts, and his own involvement in the theatre department in high school, made him decide to venture to Los Angeles to see if anything would happen. With his looks and talents, it was only a matter of time really. He was 18 when he made the move permanent, appearing in shows like Mr Rhodes, Days of Our Lives, Dark Angel, Dawson’s Creek and Smallville. In 2005, his face went global when the first season of Supernatural was aired and people liked what they saw. The series revolves around the Winchester brothers (played by Ackles and Jared Padalecki) following in the footsteps of their father to rid the Earth of demons, evil ghosts, monsters and the bogeyman. Armed with salt, their father’s journals on how to banish demons, and boyish charm, they travel across the United States in their black 1967 Chevy Impala, hunting down demons ... hoping to one day kill the yellow-eyed demon that took their mother. It’s the kind of show that would have immediate cult following – it has classic rock tunes featured in every episode, good-looking leads, excellent character development, scary stuff, comedic moments and engaging plots. Still, Ackles is also aware that Supernatural, which spends equal time on the relationship between the brothers and that of demon-busting, is a series enjoyed by a wide diversity of people, “... from the little 12-year-old screaming girl to grandfathers and grandmothers,” says Ackles. Truth is, Ackles was originally asked to play the other brother, Sam. Things might have turned out a little bit different. Playing with fire: Things get a bit too hot for Dean (left) during a seance. In the process of working on Supernatural, Ackles and fellow Texan Padalecki have become best friends off the set as well. This in turn benefits the series greatly whereby the relationship between the characters is very natural, hence allowing the actors to act off each other easily. Ackles admits that after working with somebody for so long, things like exchanging a look just happens instinctively. He says that it is also one of the luxuries that come after shooting for three seasons now – not only do they understand each other, both he and Padalecki can afford to take more chances with the characteristics of their respective characters, allowing them to read a line a bit differently from what’s written. At the same time, he humbly admits that “the writers are the brains of the operation” and that Supernatural creator Eric Kripke keeps the two of them on their toes and guessing what’s going to happen next to their characters. better and better with each season. All in a day’s work: Getting bitten by vampires is an occupational hazard for Dean. 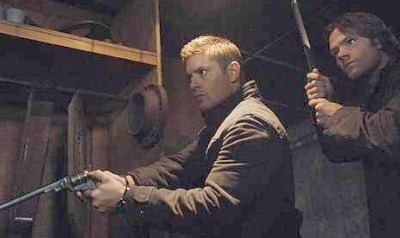 For Ackles, five seasons seems to be the magic number for the series to run – not too long and just enough to end it well. On the other hand, one thing that appears to bear heavy on Ackles’ mind is the great amount of time he spends making the series. Since he and Padalecki are in every scene, both the actors work every single day spending nine months out of every year in Vancouver where the series is filmed. This hardly leaves room for a social life or to get a couple of movies under his belt. So when Supernatural added two female characters in the third season, Ackles thought: “This was going to be our ticket to a little bit more time off. But unfortunately, they can’t be on the show without being directly involved with us, so if they’re on the show we’re on it with them.” And, he’s back to square one. Not that he’s complaining; the man obviously loves his job, admitting to missing it greatly during the writers’ strike that happened earlier this year. He says: “I really like the process of television. I like the fact that you can get months and even years of developing a character and finding the different nuances and different relationships with the different characters. “I enjoy the process of television. I also enjoy the speed of television. I get on a film set and I’m like (snores) because I’m used to working at such a rapid pace with television because we’ve got deadlines. He must have managed somehow because he was involved in an independent film titled Ten-Inch Hero last year, and he is appearing in the film, My Bloody Valentine, opposite Jaime King, which is scheduled for release sometime next year. Last year, he performed on stage with Lou Diamond Philips in A Few Good Men. He also hopes to do a Western one day. Despite his massive popularity, Ackles has managed to stay under the radar where his personal life is concerned. Even his girlfriend is a mystery, with fans conjecturing exactly who his special girl is on the many fansites they’ve put up under his name. Ackles himself is keeping mum on this issue, not wanting the extra attention. An easier reason why he’s not under the paparazzis’ view is because he’s too far removed from the Hollywood scene, being in Vancouver. A more complicated reason would be he is just not interested in being part of tabloid scandal. He says it’s not part of his personality to clamour for that kind of publicity although he’s neither shy nor a recluse. “It is not that I welcome it or want it, but the show is so intense and has such a taxing and demanding schedule, it offers me the luxury of being able to stay out of that. I guess you’ve got to conclude that, I’m not necessarily like a giant promoter of that life or of that kind of news. Supernatural is aired every Sunday on TV3 at 10pm.